We’d love your help. Let us know what’s wrong with this preview of The Mindful Path to Self-Compassion by Christopher K. Germer. “Buck up.” “Stop feeling sorry for yourself.” “Don’t ruin everything.” When you are anxious, sad, angry, or lonely, do you hear this self-critical voice? What would happen if, instead of fighting difficult emotions, we accepted them? Over his decades of experience as a therapist and mindfulness meditation practitioner, Dr. Christopher Germer has learned a paradoxical lesso “Buck up.” “Stop feeling sorry for yourself.” “Don’t ruin everything.” When you are anxious, sad, angry, or lonely, do you hear this self-critical voice? What would happen if, instead of fighting difficult emotions, we accepted them? Over his decades of experience as a therapist and mindfulness meditation practitioner, Dr. Christopher Germer has learned a paradoxical lesson: We all want to avoid pain, but letting it in--and responding compassionately to our own imperfections, without judgment or self-blame--are essential steps on the path to healing. This wise and eloquent book illuminates the power of self-compassion and offers creative, scientifically grounded strategies for putting it into action. You’ll master practical techniques for living more fully in the present moment -- especially when hard-to-bear emotions arise -- and for being kind to yourself when you need it the most. Free audio downloads of the meditation exercises are available at the author's website: www.mindfulselfcompassion.org. To ask other readers questions about The Mindful Path to Self-Compassion, please sign up. Thoughts for today... stop trying to "cure" myself and start "caring" for myself. This book was recommended to me by a doctor. It gives you tools to help you to stop having destructive thoughts towards yourself. A lot of it is teaching you how to meditate. So you can control your mind from having bad thoughts towards yourself. If you struggle with depression and anxiety as I do this book can help. Love says, "I am everything." Wisdom says, "I am nothing." Between these two my life flows. Our culture teaches us that happiness depends on external circumstances, but that is not really the case. In The Mindful Path to Self Compassion, Christopher K. Germer, PhD., states that 2/3 of people without chronic back pain display the same structural dysfunction as those experiencing pain. In another study, job satisfaction was found to be a predictor of developing low back pain. Bu Love says, "I am everything." Our culture teaches us that happiness depends on external circumstances, but that is not really the case. In The Mindful Path to Self Compassion, Christopher K. Germer, PhD., states that 2/3 of people without chronic back pain display the same structural dysfunction as those experiencing pain. In another study, job satisfaction was found to be a predictor of developing low back pain. Buddhist psychology instead teaches that it is our relationship with our pain that is the problem, and that acceptance may be a more effective strategy than fighting against our troubles. "What we resist, persists." Germer offers simple and effective strategies for changing our ingrained habits of resistance. Mindfulness meditation is neurological reprogramming that helps us cultivate a calmer and less reactive state. Since "Neurons that fire together, wire together," we can practice paying attention to what we are doing. This allows us to be more intentional in our lives on many levels. By practicing intentional attention in formal sitting practice, we can develop habits of mindfulness that can serve us in times of stress and difficulty. Having meditated before, I was surprised to feel how different a consistent Metta practice could make me feel. Practicing being kind to myself has transformed my relationship with other people as well. I find myself more able to be present. Even better, I am remembering to judge myself less when I make mistakes, and to help stop others from beating themselves up as well. I think Germer said it very well: "Give yourself the attention you need so you don't need so much attention." This frees up our energy to be more present for others, and lets kindness move through us to do good work in the world. After all, "[t]ransforming relationships with others starts with us; it is an inside job." CKG gives here an outline culled not only from his extensive reading but also from his wide experience and his genuine compassion for the human condition. He is not a guru or even well known. Certainly I had never heard of him when I picked up this unassuming book. But lo! within these covers is the operating manual that went missing when the state began to run this spaceship earth according to the military model. That was a long time ago, and in the interim we, on the whole, have evolved mostly CKG gives here an outline culled not only from his extensive reading but also from his wide experience and his genuine compassion for the human condition. He is not a guru or even well known. Certainly I had never heard of him when I picked up this unassuming book. But lo! within these covers is the operating manual that went missing when the state began to run this spaceship earth according to the military model. That was a long time ago, and in the interim we, on the whole, have evolved mostly in our capacity to eradicate opposition.This, unfortunately, includes nature,the enemy of development and also people who do not agree with the rulemakers. As a result,the fiercely competitive nature of postmodern life eradicates joy and robs us of our own creativity. What we have instead is hysteria and gossip, a tendency to compartmentalize and place our hopes on distant goals. Denial of reality is the only way most people can function at all. This book lets us off the hook without sacrificing our integrity. Instead of denying reality when it becomes uncomfortable, move toward and not away. I'm cultivating mindfulness and self-compassion; this book is a gold mine. p. 57 All mindfulness exercises have 3 basic components: stop (also, slow down! ), observe (notice and label what you're feeling), return (gently refocus on your focal object whenever you stray from it). For 10 minutes, find a comfortable position, close your eyes, take 3 relaxing breaths. - bring attention to your heart region--may wa I'm cultivating mindfulness and self-compassion; this book is a gold mine. - find your breath in the hearth region. Focus on the sensation of breathing in your heart region. - expand your awareness to your whole body--feel the sensation of the emotion. Look for it throughout your body. - Focus on the single spot where the feeling is most intense. "In your mind, incline gently to that spot." Just breathe naturally and allow the sensation to be there without trying to change it. Be soothed by your breath. - If the emotion gets too overwhelming, go back to focusing on breath. - At the end, go back to your breath for a few minutes, then gently open your eyes. p. 82 loving-kindness: wishing happiness for another person. I identify with abandonment/instability (expect to lose those close to you), mistrust (expect to be hurt or taken advantage of), emotional deprivation (feel like can't get needs met), defectiveness/shame (something is wrong with me), social isolation/alienation (alone in the world, not the same as everyone else), failure (fundamentally inadequate, will fail), unrelenting standards/hypercriticalness (perfectionist, nothing good enough). Phew! No wonder I'm having such a hard time with everything. "Say to yourself, 'Over the next 15 minutes, I'll check every minute ro so to see if I'm having a self-critical thought." Use a beeping thing if you have one. Count. 20 minutes -- sit comfortably upright and relaxed. Close your eyes, focus on heart region, 3 slow, easy breaths from the heart. - "Just as all beings wish to be happy and free from suffering, may I be happy and free from suffering." May I be safe. May I be happy. May I be healthy. May I live with ease. - take your time, be patient, direct yourself back to the phrases when your mind wanders. Go back to the initial sentence when you need to feel it more. - let it be easy--don't struggle. - At the end, gently open your eyes. sit comfortably upright and relaxed. Close your eyes, 3 deep, relaxing breaths. start meditation: sit down for 3 seconds. Do longer if you're ready. 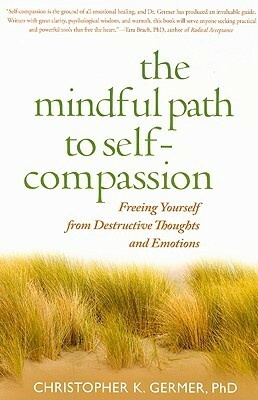 This is the most comprehensive and most valuable book on self-compassion I have come across. 4.5 stars for sure. The author clarifies the relationship between mindfulness and self-compassion. And does so in a way that brings many ah-ha moments. Even with having read a lot about self-compassion, I feel I read things in this book I hadn't come across before. And for that I am grateful. I recommend this book to my students and clients frequently. We all struggle with self-compassion to one degree or This is the most comprehensive and most valuable book on self-compassion I have come across. 4.5 stars for sure. Similar to the mindful book on depression, I found myself feeling this book was written/geared more for that of a lay person. Therefore I found little of it refreshing or helpful for me. The Mindful Path to Self Compassion Freeing Yourself from Destructive Thoughts and Emotions by Christopher K. Germer, Ph.D.
Christopher Germer is writing a book that combines buddhism, meditation, and psychology. While it includes buddhist practices, there is little preaching. In some ways, the book mirrors the concept of a higher power in alcoholics anonymous where the practitioner is asked to believe in a higher power, but not necessarily a religious one. Librarians often run into issues surroun The Mindful Path to Self Compassion Freeing Yourself from Destructive Thoughts and Emotions by Christopher K. Germer, Ph.D.
Librarians often run into issues surrounding this material. Sometimes we are asked to find books on meditation for example, but not religious meditation, or yoga, but not with a religious element. The meditation exercises are focused on accepting emotions, self compassion, and "loving kindness." This is not a self help book in the traditional sense. It is more focused on self acceptance than self improvement. I read the book much faster than the author would have wanted me to. This book is meant to be used over a length of time. The meditative exercises in this book take time to do. Some of them are not easy. Because this is a book of practices, the person using it will get as much out of it as they put into it. Some of the types of exercises are walking meditation, breathing exercises, repeated phrases, and keeping a journal of your emotions. Christopher K. Germer combines meditation with emotions. In addition to exercises, the author includes psychological research and neuroscience. You could call this book a book of complementary psychology, much like complementary medicine combines traditional medicine with alternative practices. Some of the concepts I liked were the "hedonic treadmill", and changes in brain function associated with long term meditative or religious practices. The author is a Clinical Instructor of Psychology at Harvard and a founding member of the Institute for Meditation and Psychology. There are several appendixes, extensive notes with citations from prominent journals, and an index. Very nicely written guide for beginners, but some of the thoughts and practices might be beneficial even for more advanced meditators, especially for those who's been doing mostly concentration techniques, but would like to incorporate more mindfulness and self-compassion. I especially liked the variety of different ideas and exercises, so there's something for everyone, really. Beaucoup aimé cette référence. L'étape suivante après une thérapie centrée sur la pleine conscience. For years people have been telling me that I should meditate. and for years that meant nothing to me - in that I couldn't even picture what that would be/mean (even having grown up around Buddhists). In a moment of need, I started googling books on mindfulness and guess what was at the top of these lists? This book which someone had already given me. I dug it out of my book shelves and jumped in. It was the first time that I felt like I had practical instructions and explanations for what mindfu For years people have been telling me that I should meditate. and for years that meant nothing to me - in that I couldn't even picture what that would be/mean (even having grown up around Buddhists). In a moment of need, I started googling books on mindfulness and guess what was at the top of these lists? This book which someone had already given me. A great book to read or just to flip through; it is easy to read and well organized. It has practical meditation guidance for harnessing self-compassion and loving kindness in a daily life. It is a psychology book, not a spiritual book; although there are many references to Buddhism and a few other religious traditions. I found this as a helpful follow up to Kristin Neff's book Self-Compassion. Throughout the book the author guides reader to find the healthy range of emotional balance through se A great book to read or just to flip through; it is easy to read and well organized. Throughout the book the author guides reader to find the healthy range of emotional balance through self-awareness, self-compassion and meditation. He points out the signs of common mis-understandings and mis-applications of mindful and compassionate meditations. The guidance is general, yet there are helpful guidances on how to apply it to daily life based on different personality types and circumstances. I see that a lot of thought, experience and wisdom went into writing this book. I really appreciated the author showing what self-compassion is and it isn't. "The challenges in our lives are too diverse to respond to self-compassion alone, but, in combination with other tools at our disposal, self-compassion can make life a whole lot easier." As a therapist, I use some exercises from this book with my clients. I know this might concern some of my Christian friends, but often, very anxious people need tools to keep in their toolbox so their minds don't race when they are lying in bed or feeling overwhelmed from some trauma. I don't agree with the philosophical underpinnings of the book as a believer. I do think that some of the exercises and illustrations are helpful for people who struggle with anxiety. I think the author has an int As a therapist, I use some exercises from this book with my clients. I know this might concern some of my Christian friends, but often, very anxious people need tools to keep in their toolbox so their minds don't race when they are lying in bed or feeling overwhelmed from some trauma. I don't agree with the philosophical underpinnings of the book as a believer. I do think that some of the exercises and illustrations are helpful for people who struggle with anxiety. I think the author has an interesting background being raised as a Christian and his journey with eastern meditative practices. Take what's good and leave the rest! This is a wonderful book. It teaches how to treat oneself with more love and kindness by using meditation to facilitate the practice. I have often wanted to meditate, but could not find a practice I could follow. This book introduces the use of metta and I can do that. I would recommend this book to anyone trying to become more accepting of their life and themself. This was the first book I ever read on the subject of mindfulness/Buddhism, and I devoured it, unlike a lot of self help type books that get bogged down in jargon and cause me to lose interest. I've since read many more books on the subject but this is one of my favorites. ...probably the best intro book to mindfulness and artful problem solving. Does not require hours of practice or formal meditation. This book is about bringing peace and mindfulness to every waking moment without much of the 'hokus pokus' that some books have. I thought this was a good book. It gives a little bit more than what the standard self help books teach. I really needed something like this and was so glad I got my hands on it. To be fair, I really skimmed through the second half; but the first half of this book really is great. And I commend the author's knowledge and efforts. I'd add this to the list of books that have changed my life. Germer's website gives away a lot of information from the book; this generosity makes attracts me to reading the book.